I am so thrilled to be sharing some after photos with you today of our laundry room we have been renovating. 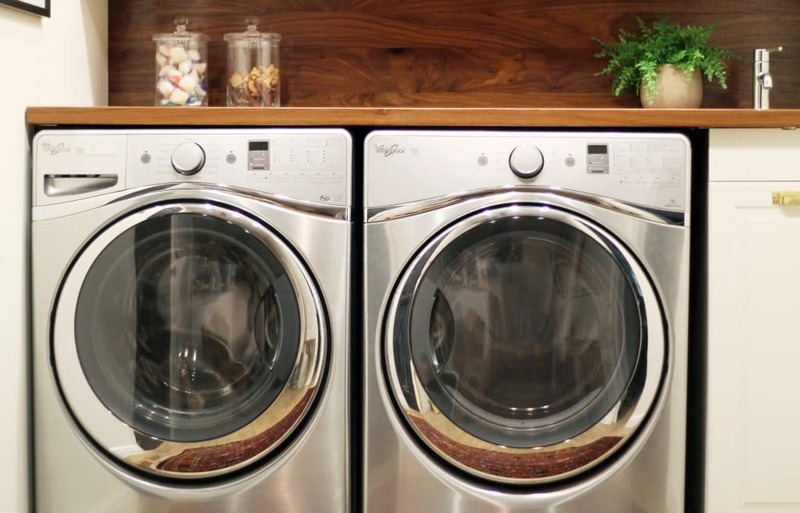 This project has been one of our favorite and a very new kind of project, because it wasn’t a laundry room to begin with at all. Maybe you remember, it used to be a 4th bathroom off of our kitchen/dining room! We never used it and no guest wants to use a restroom right off of the kitchen. Fortunately, we have another bathroom in the entry to our home and we started brainstorming how to make better use of this space. That’s when the idea sparked to turn our old laundry space into a walk in pantry and this unused 4th bathroom into the laundry room. 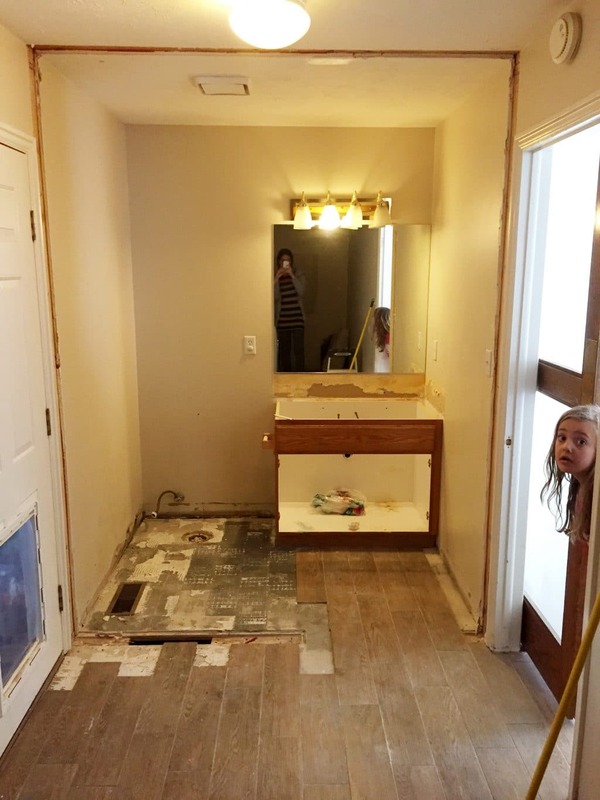 I couldn’t find a photo of this area before we laid the new flooring in here, but after we started demo, we had to tear up a portion of the wood tile and re-lay it where the wall, toilet and vanity were. We also had to take off the whole back wall to move the washer and dryer hookups over here, a vent for the dryer that directed out of our roof, and although it was tight, we even made room for a small utility sink! This room doesn’t have any natural light, so we installed 4 small recessed lights and 2 beautiful accent lights to really brighten up the whole space and make it feel a lot larger. If I zoom out a few feet (see below), you can see the sliding door to the right leading to our great room (kitchen, dining and living) and the door to the left, which we painted a satin black to update it, leading to our garage (and side yard, hence the doggie door). 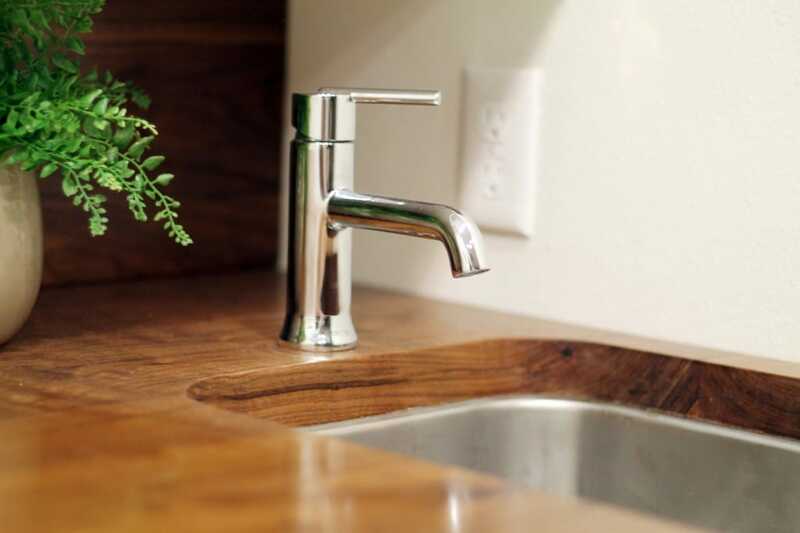 Having a sink in here was really important to us, and we were thrilled to find a small bar sink that fit perfectly into a slim 15″ wide base cabinet. We looked at so many laundry rooms with sinks and almost all of them had a step down countertop from the appliances to the sink, but there was no room here for a step, so we mounted the sink directly to the walnut countertop underneath and added a filler piece between the cabinet and sink to close the gap. We love the height and the seamless countertop. Truly couldn’t imagine it any other way. Although I’m sure the sink will come in handy for lots of reasons, we mostly use it for filling up Charly’s nearby water bowl (we recently DIYed!) throughout the day. In fact, the laundry room is kind of Charly central. Her food and water bowls are in here, but also we keep her treats in one of the glass canisters on the counter (the other filled with laundry tablets), her large bag of food is kept in the big pull out drawer in the base cabinet (love that thing), and one of the baskets above is dedicated to her–filled with her leash, harness and toys. Adding an open shelf under the closed cabinetry was a last minute decision we actually made while picking up our cabinets at Ikea. We were walking through the showroom and saw a similar example and loved the idea of easy access to often used items. Right now, we have a basket dedicated to socks without a match, Charly, dryer sheets and an empty one–I’m sure it’ll have a purpose soon enough. 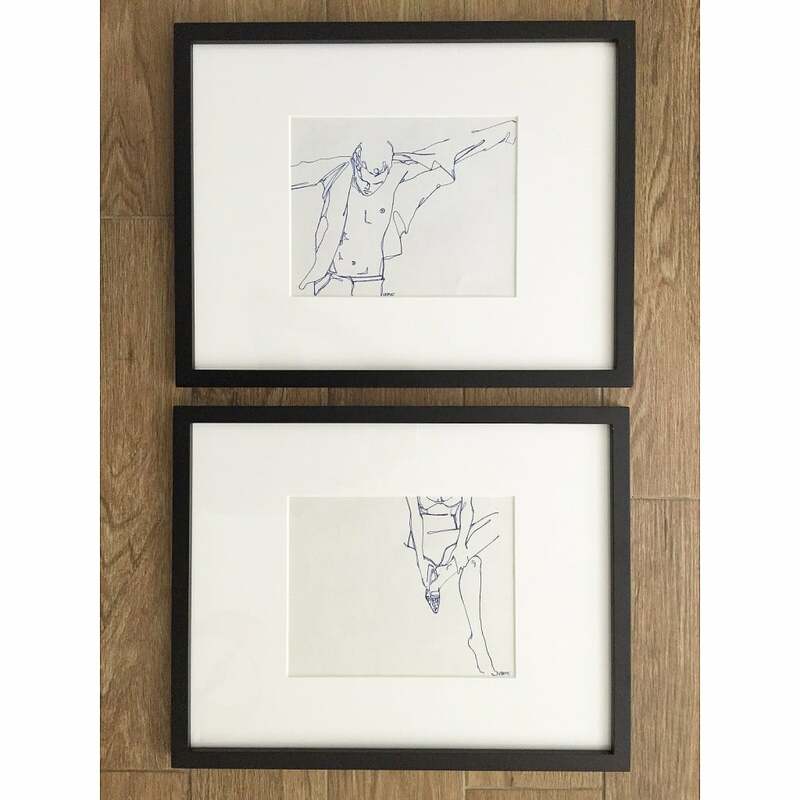 On the left wall, I commissioned my sister, Victoria, to do a his and her getting dressed drawing and they turned out so much better than I had even imagined. On the right wall, we hung a valet hook so I can fold and hang clothes all right here, or even hang something to dry if need be. It folds up when it’s not in use and packs so much function in such a little thing. Through all of this, the real stars of the show are the actual washer and dryer, appropriately. We’ve been using them for a couple months now and they have truly made our lives easier and our laundry cleaner. In fact, while we were away in Mexico, my mom watched the girls at our place and washed allllll the clothes because she loved using these so much. I understand–they’re great and strangely fun. No wonder they have over 500 5 star reviews. Also, easy on the eyes. Now we’re ready to whip the rest of the plans into place in the kitchen–onward!! To read/look back on every post regarding the laundry room, click here to be directed to the titles. « Thoughts on Blogging + Kitchen Kickoff! 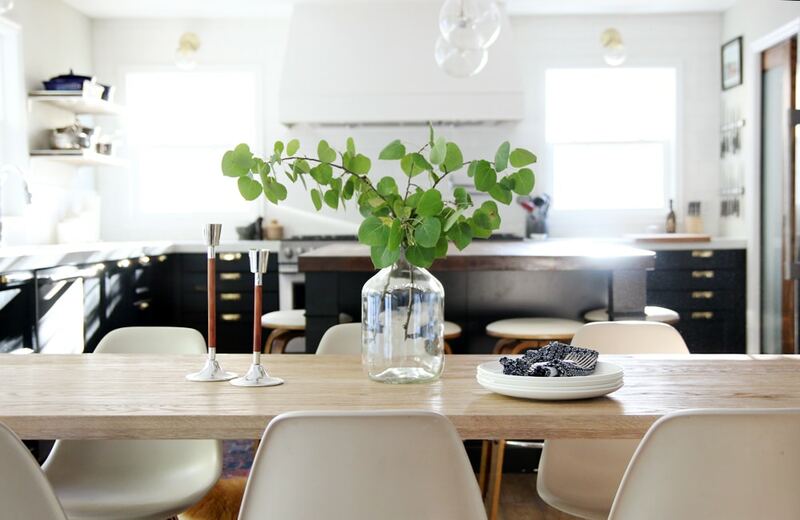 A New Table + The Dining Room Before & Afters! What size are the picture frames on the wall? Thanks in advance! I am so sorry about the fire at your A-frame. I can’t even imagine the heartsickness of having done all that work and the wonderful pieces you found for the different rooms. I love your style and try to mimic it somewhat in our home. I’m also thankful that you and the children are all safe. We almost took our young son on a whitewater raft (or I should say I wanted to but when we got to the launch site the man who steers the raft and my husband both said No. Way. could he come along. I was totally unschooled in the whole rafting thing and so I was disappointed. The wife of the other couple with us said she’d stay with our son and meet us at the take out point. Just before the take out point the water became extremely wild – the front of the raft flipped end over end and I flew through the air, landed in a whirlpool that kept sucking me down. It finally released me. I lost my glasses but that was the worst of it. We later found my glasses in the back of their van (total mystery). The river had seemed so calm and relaxing when we put out and I thought it would be that way all the way to the take-out. I was shaking like a leaf and couldn’t let go of my son all day. I also had nightmares for weeks, months. So I kind of know how you feel even though we lost nothing but my pride. I hate to ask such a trifling question at this time, so feel free to take your time answering me. We have had a few break-ins on our street lately and I’m thinking of getting a guard dog. You said yours was very protective, Can you tell em what kind she is and how old? Did you get her as a puppy and was she rambunctious? Is she older now and calmer with age? We are retired and don’t think a rambunctious puppy would be something we feel we could tackle right now. thank you so much for taking the time to answer me. What color are the baseboards? I love this idea for the bathroom! Our bathroom is just about the same size as the one shown. We have a smaller ranch with the laundry is in the basement. We only use the main bathroom and not the half bath, and want to move the laundry up to the main floor. This bathroom looks great. Gorgeous! I keep cycling back to this on Pinterest! Most questions are answered below (grrr to code that means we HAVE ago have the shut offs visible above the countertops….). Couple of boring but necessary questions….how much of a gap did you leave between the machines and the countertops? Am concerned about mine overheating…then how much gap between the countertop and bottom of the open cab? Thanks so much! There’s not much of a gap between the machines and counter–less than an inch? And there’s 13 inches between the countertop and the bottom of the cabinet. 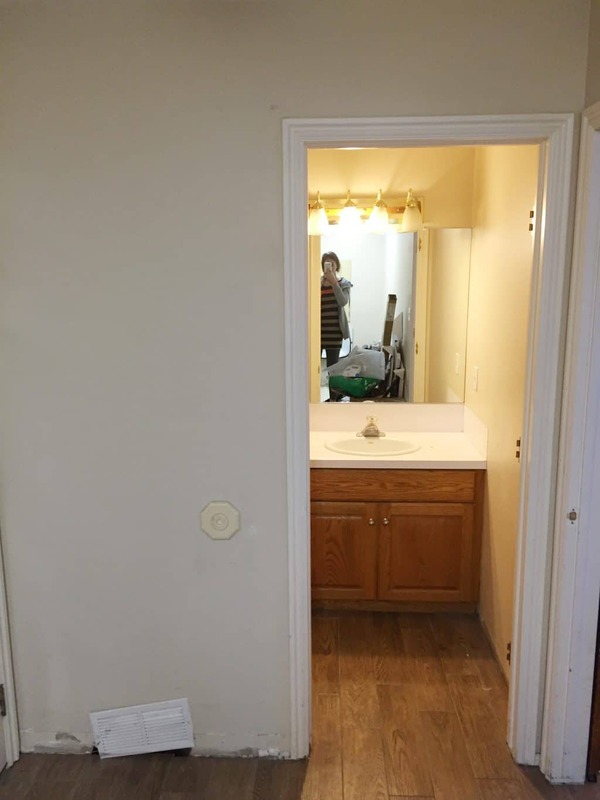 Can we see pics of the other side of this laundry room? Just curious. Instastories would be awesome! Sorry if this has already been answered somewhere, but how did you hide the washer hookups/shut off valves? Where we live, I think it has to be a certain height to be up to code, so it is slightly above the back of the washer. I’d love to put a countertop there but I can’t think of a good way to hide the box where we can still access it! Ours are behind the washer and dryer. Sorry that probably doesn’t help! There’s no code like that here. Love this! We are looking at IKEA cabinets for our laundry room. 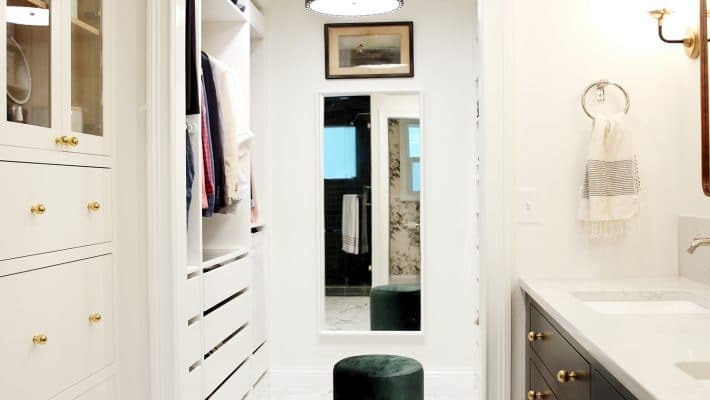 To achieve the open look, did you buy a cabinet and then a smaller door, leaving the lowest shelf open, or does IKEA make separate open shelves? Thanks! I love butcher block counter tops in a laundry room! They go with the stainless steel appliances so well. Thanks for sharing your transformation… it will help me on my laundry renovation. Great inspiration as I begin on my own laundry room redo! 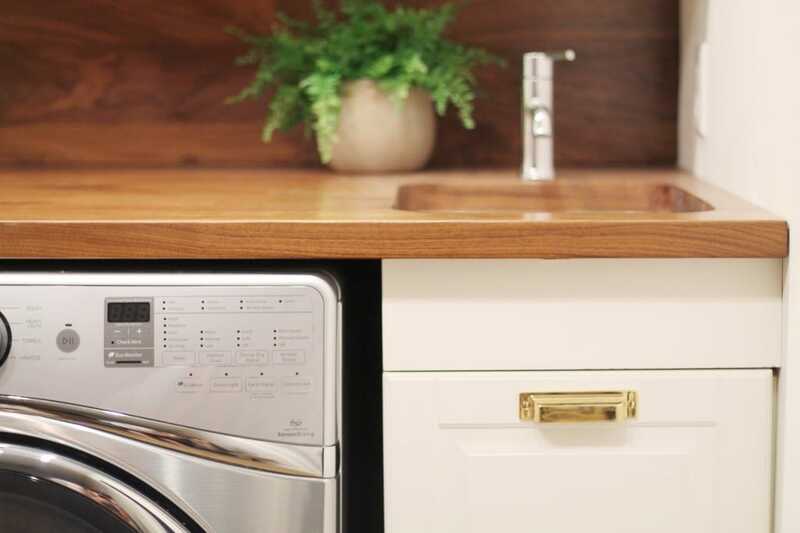 Quick question… it looks like you sink cabinet is the same depth as your appliances. Did you use a custom depth cabinet, or bump it out somehow to match the appliance depth? I’d love to know more because I love the streamlined look that having everything the same depth gives. 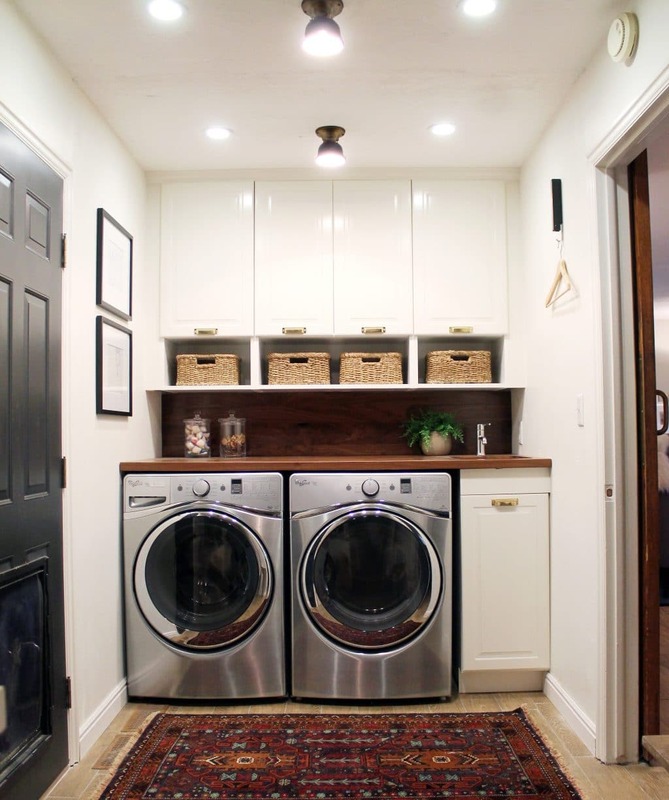 I love this laundry room and am copying it as closely as possible! I am having trouble locating the open shelf under the cabinets…do you remember which IKEA collection it may have come from? Also-your wall color if you don’t mind sharing. Love the sink. Where is it from? Currently redoing laundry area and that sink could be my solution. Space and storage is priority for me. This is so random, but we are kicking off a laundry room remodel ourselves, and that remodel is basically recreating what you guys have done here, because I love it. Only thing that I am struggling with, the DIY butcher block site is taking me to an ENT? Has anyone been able to get in touch with the mysterious store.craft-art.com? oops! Wish my last name wasn’t there. Could you delete, because for some reason I can’t! We are considering doing something very similar (with the duet w&d) in our soon to be remodeled laundry room. Did you cut out a slot for the lint slot or is it in a different place on the duet? The lint catch is inside the dryer. Is that what you mean?? I am in love with your sister’s art! I am totally going to buy them and hoard them since I don’t have space for them now. Did you use Framebridge to frame these as well? I really love your taste. You always seem to be on trend without seeming trendy or copying. I just love this laundry nook! Would you mind sharing the trim and ceiling color? I am TERRIBLE at picking out colors! This space is so inspiring! 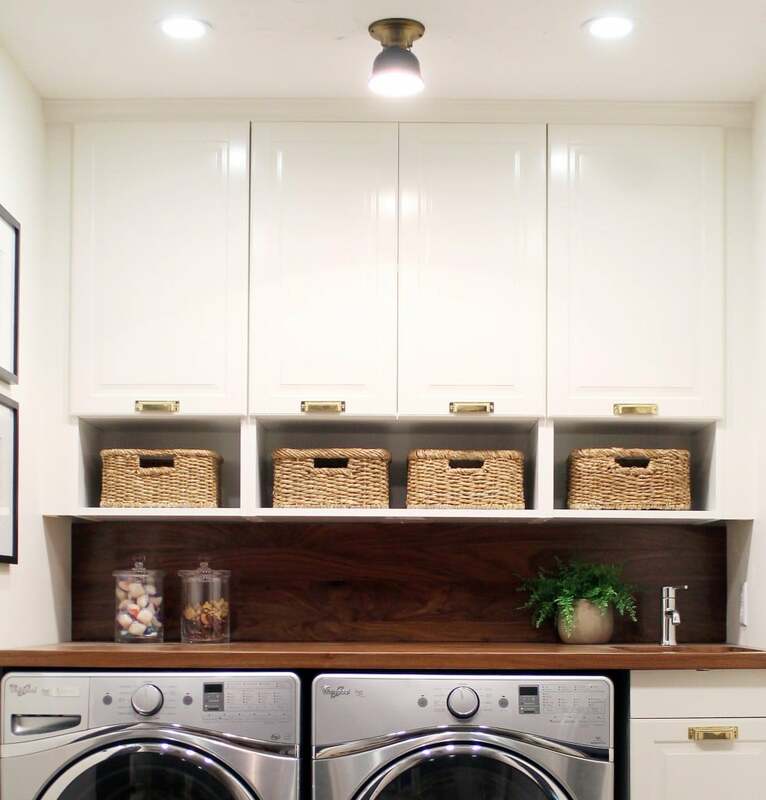 I love everything about this laundry room – especially the W+D. Definitely on my wish list!!! The room turned out amazing. Can’t wait to see the kitchen and pantry come together now to complete the space. Gorgeous! Just don’t accidentally feed Charly a laundry soap pod instead of a treat! So. Pretty. Love! I had an open shelf in my previously laundry space and I totally loved it! Definitely going to be putting one in our new space for sure. You’ve done such an excellent job here with the overall design – it’s amazing. 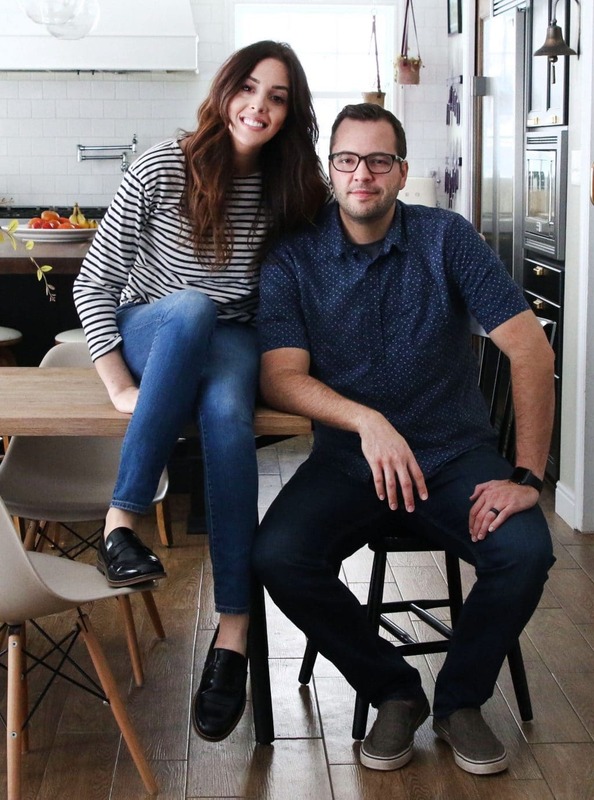 From us here at Craft Art, we applaud your vision and how you show individuals following your site that Craft Art DIY countertops can add warmth and style to more than just a kitchen. Can’t wait to see what’s next!!! I do have one concern, though… the outlet you have right next to the sink is not GFCI. Being so close to water, it really should be swapped out so you don’t accidentally zap yourselves if it gets wet. Something important to remember for your upcoming kitchen remodel as well, and an inspector is likely to fail you for it in a big kitchen reno (unless you’re lucky enough to not need permits for such remodels where you live). 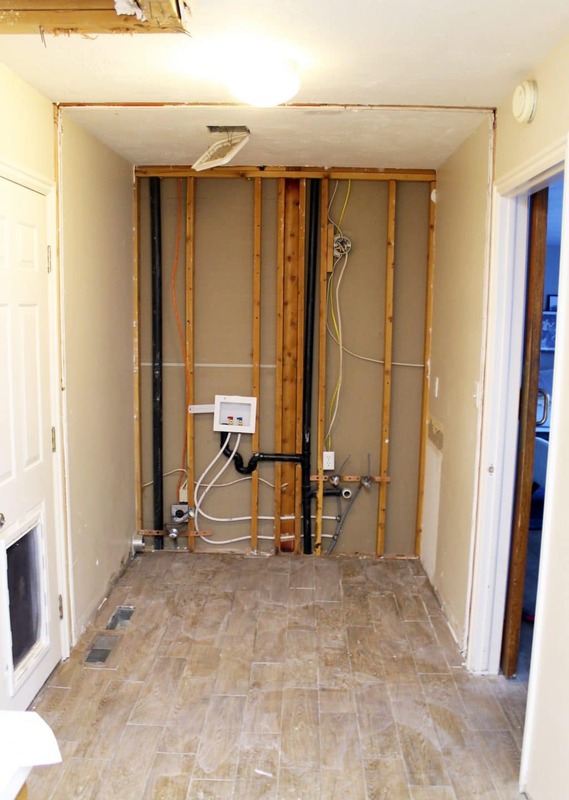 You put so much effort into the look of the room and I hope you will consider using your blog as a platform for making sure remodels are done safely and to code as well. I love reading – keep up the beautiful work! We totally thought the same thing! We need to get that switched out ASAP. Thanks, Amy! What a luxurious space to do laundry! This is so random but what kind of light bulbs do you guys use in your house and in your laundry room? I like the bright, clean light in your house and up until a few years ago never had a problem finding light bulbs haha. My house has all these new light bulbs that look really yellow and throw off any wall color I pick. Any suggestions on what to get? Gah. I wish I could remember which bulbs we got. Someone else recently asked to same question. The funny thing is, we spent so much time picking them out you’d think I could remember. They are an LED type from Lowe’s. And we looked at the Lumens, and chose one that had a really bright light that wasn’t in the cool range or super warm. Right in the middle. Congratulations! It looks great and the revised use of space (with the pantry and laundry) is so amazing! Beyond gorgeous as usual! Go, Marcums. You guys amaze and inspire us! Honored to find our products in gorgeous space…as always, beautifully done! This turned out fabulous! We are thinking of turning a small vanity area adjacent to our bedroom into a laundry area. This has inspired me to do my best to include a sink in those plans! Perfect for small hand-wash or stain pre-treating jobs. Sheer perfection. So chic, stylish, and functional. You guys are the bomb! The new laundry room is absolutely lovely! Well done. I’m usually a silent observer :) but this time I just have to speak up and say wow, excellent use of space and the space is just beautiful. I love the contrast of the black and white and the warmth of the countertop. So pretty, so you. I’m inspired! I have to say, I am thrilled to see such a tiny sink being used in this laundry room though! We need to reconfigure ours (once we get to that phase), but our contractor initially told us we’d have a hard time finding a sink so small. When there’s a will, there’s a way! Y’all nailed it! Laundry never look so chic! Looks great! I like that it’s very clean and simple. 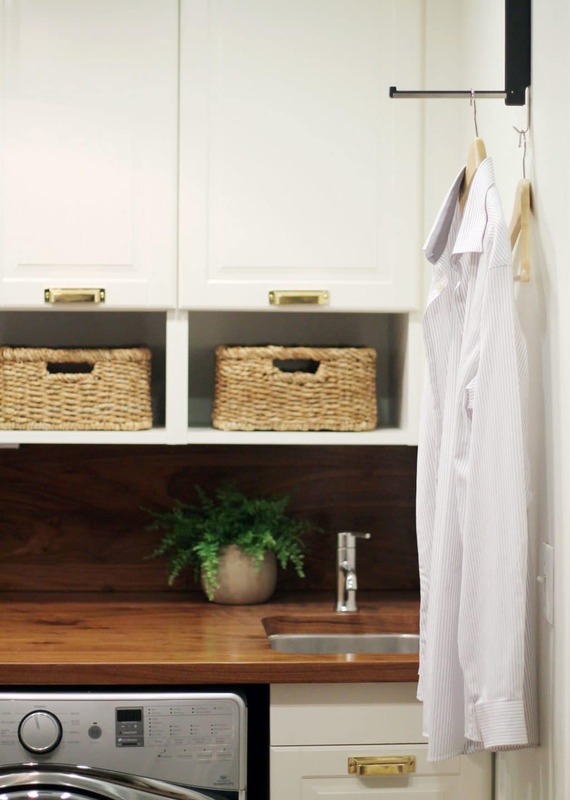 We have a teeny tiny laundry/mudroom that I want to redo and something like this might work well (although sadly we don’t have any room for a sink). This whole spot is 72″ wide and really only as deep as the washer and dryer. I can’t believe what a waste of space our old laundry space was–so long and useless. 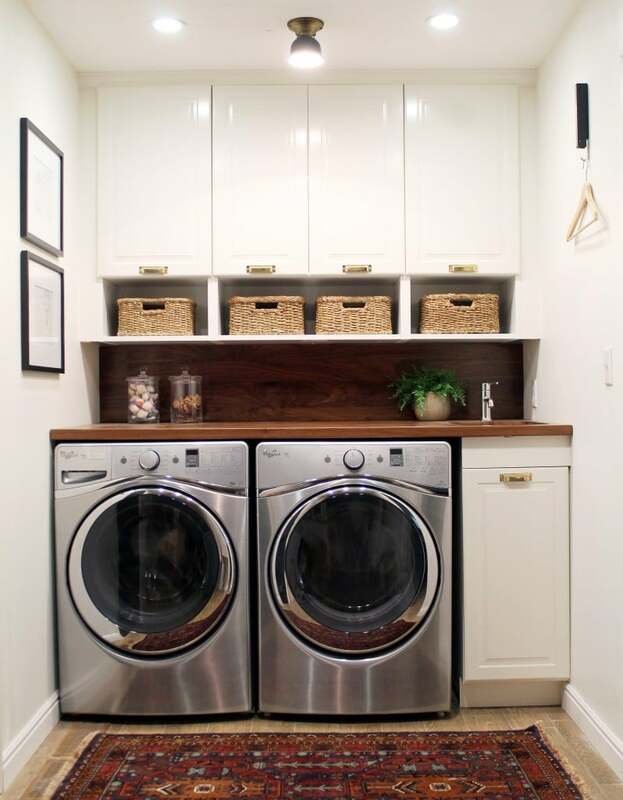 Small laundry rooms for the win! 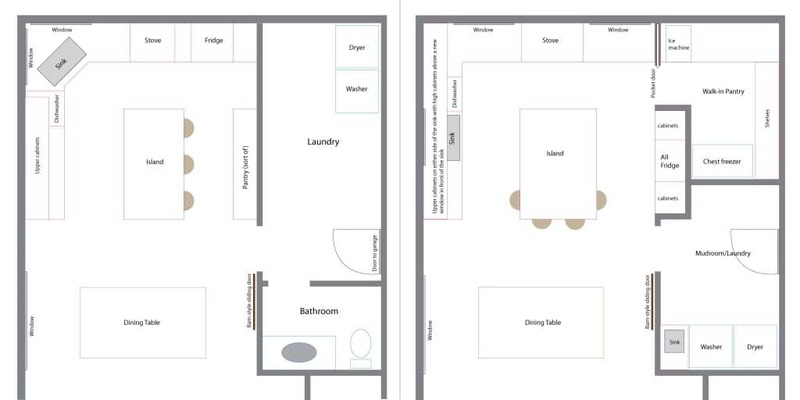 I really like the way you added the floor plan drawings, to better understand the space. Thanks. Love it all!!!!! Nailed it, Again! looks amazing and great balance of form and function!!! Such a dramatic before and after. About the lost socks, lingerie bags are great for keeping tiny socks together. I hang one on my boys’ hampers. Both my 3 and 5 year old know to put their dirty socks in them when they get undressed. Then I just zip them and toss them in the laundry. Keeps all their socks together!! You’ve done it again! Another amazing space! Bravo guys, well done! I think it turned out great! But… my big questions is, what’s happening on the wall opposite the washer/dryer?? We will be walling it in with floor to ceiling lockers for a mudroom look. And beyond that wall will be our walk-in pantry. Still so much to do! Looks great! I rarely comment but wanted to say that the wood really balances the room well. 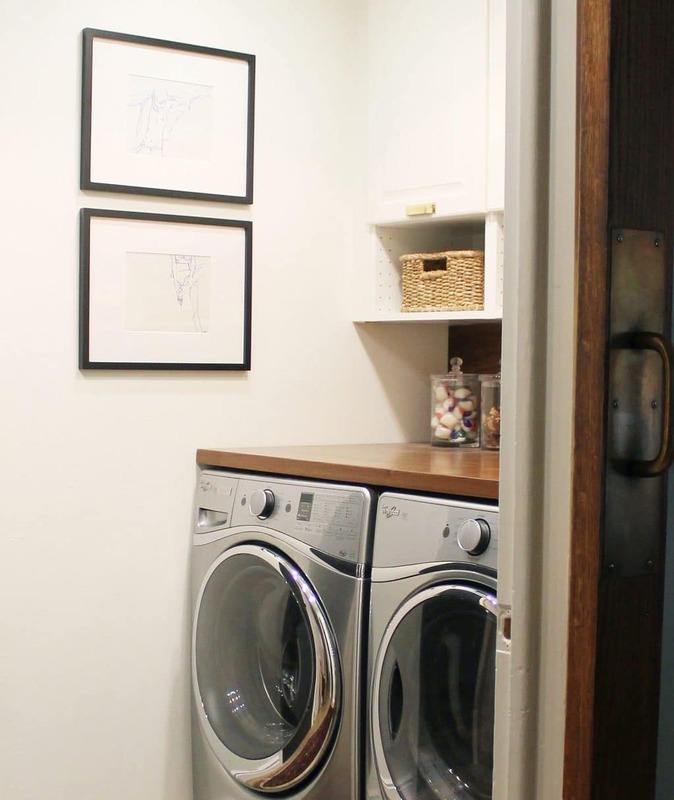 Finally an actual functional laundry room on a blog! Everything look beautiful and so functional, but, what really struck me was the size of that doggie door!! And it blends in so well I might not have noticed it if you hadn’t pointed it out! Do you have a hard time keeping the girls from playing with it? We have some smaller doors for our cats (and I have a home daycare), so I catch kids playing with the doors all.the.time. Hahaha! It’s huge because she is hu-uge! I think they’re both completely over it and don’t even notice it anymore. Generally, I let the girls touch something as much as they want the first day or so (go ahead, take alllll the dvds off the shelf, go in an out of the dog door 100 times) and then, I explain that is just for Charly to go outside and they don’t even care. I love everything about this! You chose gorgeous finishes and packed so much function in. I love that you made your house function/work better for you. Awesome job! My laundry area is in my unfinished basement and is dismal – I am so envious of your gorgeous room (on your main floor)! what a stunning transformation! great job! I am in the market for new a washer and dryer. How does the dryer do getting rid of Charly’s hair? We have a large dog also so there’s always a lot of hair and dirt around. Everything looks great and functional! I feel your pain! These are all-stars at that. Charly has shedding seasons throughout the year (usually just two major ones) and it seems we’re always covered during those times. Our clothes come out of the dryer, hair free. But there’s usually Charly hair to clean out of the washer. This is one of my favorite Before/Afters I’ve seen! I just can’t get over that countertop, I would probably hesitate to use it in a kitchen area, but for a laundry area I’m all for it! I also love the decision to leave the bottom of the cabinets exposed, it’s really a game-changer. I think this was such a great idea structurally as well. 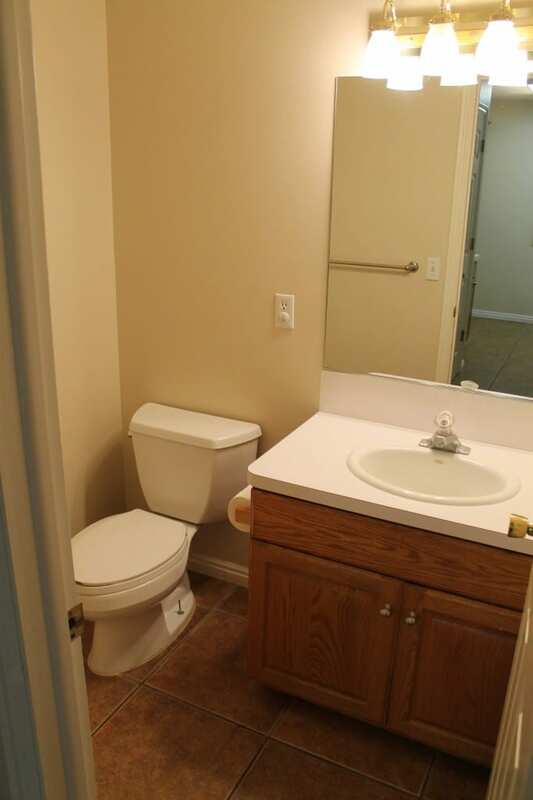 I get that sometimes because of space you may be forced to put a bathroom next to a kitchen, but I don’t understand why they did it in your case. No one wants to see a toilet from the kitchen! I also never realized I needed a valet hook, or that there even was such a thing! I’m adding that to my laundry room ASAP! Really gorgeous! And that valet hook…might be the answer to my husband’s clothes being on the floor each night! Love the entire space!! So warm and inviting and will tie in beautifully with overall scheme. Wondering, though, what’s the wall opposite the washer and dryer look like? I know Charley’s bowls are there…command center? Lockers? Hooks? Right now it’s completely open, but that wall will be lockers for a mudroom kind of space (Charly’s bowls will move orientation eventually). We’ll be addressing that and the walk-in pantry as a part of the kitchen remodel. 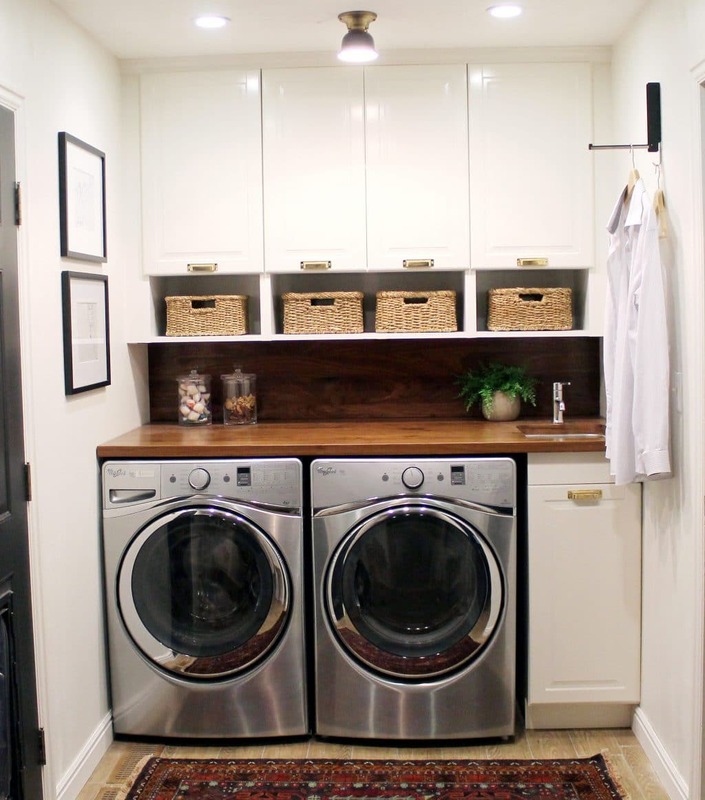 So thrilled/happy/honored/proud to be featured in this laundry room redo! To have my work hung in such a stylish (high-traffic) area, makes me feel great :) Please commission me again! Where did you get that sink? It is exactly what I’m looking for! I think we bought it through Lowe’s website? It’s a bar sink.